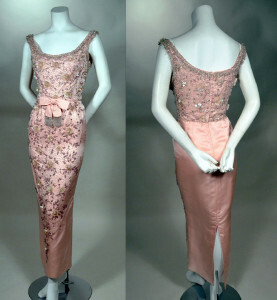 60's vintage beaded, rhinestoned and sequined column evening gown. Pink silk satin and silk lining. Beaded bodice and center front panel of skirt. Beading consists of crystal seed and bugle beads, thick clusters of shell shaped sequins, aurora borealis large beads and rhinestones. Fitted bodice with 1 1/2 inch straps, princess seaming. Deep scoop neckline front and back with bugle bead fringe edging. Self piped waist. Self bow with beaded fringe center front. Tapered full length skirt. Deep vent center back. Center back 16 inch metal zipper closure. Fully lined. A classic column... glam and glitter!! Bodice length, measured from shoulder to waist - 15"
Skirt length, measured from waist to hem edge - 37"
EXCELLENT condition. Shows the odd missing bead (inconspicuous) and some minor light soil marks at skirt. Lining shows some faint age discoloration.